Not so colorful situation at Catalpa Gardens Reviewed by Edgeville Buzz on December 14, 2009 . Realtor Sue Fox writes about a troubling situation at the Catalpa Gardens condo building. 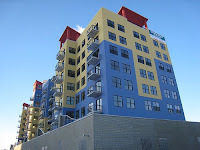 There are currently 13 short sales listed in the building, and the developer has yet to even sell its remaining units. According to Fox there is a 2 bedroom unit listed for $192K on the MLS which sold for $440K in 2007. Read her article here. Photo courtesy of YoChicago on Flickr.